Please click here to view the Norway trip presentation. Please click here to view the Norway trip initial letter. On Thursday 7th March, four intrepid mathematicians from Year 8 represented Spalding High School in the “Team Maths Challenge, Regional Finals” at Kings School, Peterborough. The day was made up of several rounds to test problem solving, mental maths and teamwork. There was a warm-up round, a cross number, a relay race and the grand finale was a shuttle round whereby the team split into two pairs they had to run up and down the school hall to collect and pass answers, only being able to move on to the next problem once the last problem was solved, presented and passed on! As it turns out, it is an exhausting business all this problem solving. • The product of four consecutive positive integers is 24024. What is their sum? • Six years ago, Kavin was 3/5 of his current age. How old is Kavin now? • Luigi’s shirts are either white, green or red. Six are not white; six are not green; six are not red. How many shirts does Luigi have? • I think of a number. When I divide 72 by one more than my number, I get the same answer as when I divide 54 by one less than my number. What is my number? The team worked together exceptionally well, rising to the challenges presented during each and every round. They were up against some very tough competition and finished in a very respectable 7th position out of 22 competing teams! Each pupil that competed gained a certificate of participation and a lovely UKMT pencil case. Well done to everyone that took part! The whole school sponsored walk took place on the afternoon of Friday 28th September and was about 5 miles. The weather was very kind to us and the atmosphere was really great on the walk, with almost the whole school taking part. In total, pupils raised a fantastic £8,646; two pupils raised an amazing £190.00 each, they were Abigail Armstrong and Chloe Matthew. The money will be used to improve the School environment and fund projects suggested by pupils through the School Council. We also supported Macmillan Coffee Morning on the day and staff and pupils baked and bought cakes to share after the walk. We have donated £1,000 to MacMillan Cancer Support. Please click on the link below to read more! Thank you for your continued support – total raised this year £3,100! Mr Martindale attended the International Women's day celebration conference at Park Air Systems and spoke about how important it was to encourage girls into engineering. While Spalding High school has seen recent pupils entering a wide range of engineering courses at University it is still seen by many as an oily and physical job. 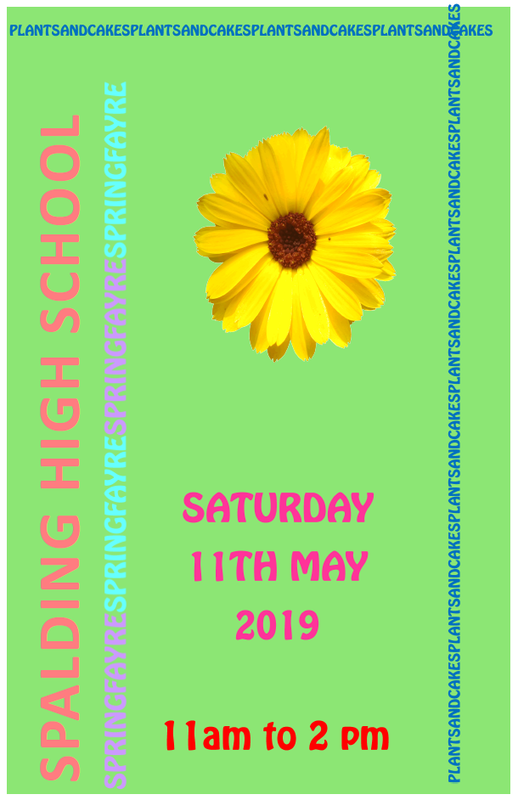 The sponsorship will be used to set up Spalding High School's all girls robotics team to compete in the First Lego league; a lego robotics competition which promotes engineering as a problem solving activity requiring teamwork and analysis skills. "We are extremely grateful to Mr Goodall and Park Air systems for their sponsorship, especially in the present economic climate. 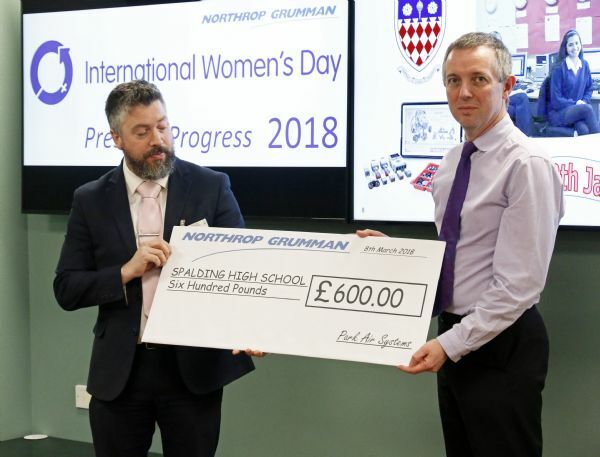 It will give our pupils both the opportunity to take part in such a wonderful competition, and will reinforce that engineering is a diverse world with fantastic opportunities." Park Air systems already sponsor teams at the Deeping school and in primary schools, but are particularly interested to see an all girls’ team take part. "Since Mr Goodall first contacted me it has all been very exciting"
Mr Martindale (above) receiving £600 sponsorship from Mr Colin Goodall of Park-Air systems in Market Deeping. On Friday the U16 football team won the Lincolnshire County Cup final. The match was played at Sleaford Town Football Club against Bourne Grammar School. The girls gave an outstanding performance on the day and were convincing winners, scoring 4 goals and also keeping a clean sheet. More success for the riding team! In the Easter holidays, 2 teams were entered into the jumping with style competition held at Codham Park in Essex with hope to qualify for the JWS championships held in October, but unfortunately the injury of Lucy's horse meant that the team had to withdraw from the classes. Amy Whittington went to the competition as an individual and represented the school beautifully. Amy and her horse Vernon (Newmarket Adventure) rode a stylish clear round a technical course to finish 6th out of a large number of competitors in the 90cm class. They then went on to the 1m class and again rode a fantastic round, with an unfortunate pole dropping them to 5th place. The final and biggest class of the day, the 1.10m evidently suited Amy and Vernon the best with them winning the class and gaining an individual championship qualification! After the consultation, Ofqual have released their decision and a letter to parents and students explaining the results.